Tourism booming in New Zealand and Lions tour still to come. Recent figures show that the tourism industry is now a bigger export earner that the traditional dairy industry. For the year ending December 2016, total exports of dairy and related products were $12.05bn, accounting for 17.2% of all exports. Over the same period, tourism (including air travel) was worth $12.17bn, or 17.4% of exports. These compare to 18.2% and 16.9% (respectively) for 2015, showing the increasing importance of tourism to the NZ economy. After these two industries, the next largest export is meat, all the way back on 8.4% of total exports, leaving tourism and dairy well out in front. If you look at GDP figures – Tourism accounts for 5.6% whilst Dairy is 5% of GDP. What are the drivers behind the tourism numbers? 3. The 2011 Rugby World Cup and 2015 Cricket World Cup boosted arrivals significantly. Also there are two further events which are bound the increase tourist numbers – The World Masters Games that finished today and the British Lions Tour in June/July. The Lions Tour is bound to have a significant impact on the economy especially with the hype that is currently building which largely comes about as the tour only occurs every 12 years. Contribution to New Zealand’s GDP – 16,000 supporters at approximately $10,000 per trip equates to NZ$160 million or 0.1 per cent of GDP. But spending doesn’t equate to value added. Value added is broadly a third of the initial spend therefore this leaves a direct macro impact on value added of $53 million. Second round multiplier effects increase the impact to NZ$132.5 million or broadly 0.1% of GDP. Retail sales figures for June 2005 were up 1.2%. Accommodation providers, for example, experienced a 5.1% increase in turnover during June. And spending in bars increased by 3.9% in June from May and spending a café and restaurants increased by 1.3% while liquor sales surged 3.7%. Some economic pricing invariably led to higher prices in some markets. A terrace ticket cost NZ$100 for the Lions vs All Blacks game at Eden Park but excess demand on the black market did mean that some tickets were double the face value. Also prices in bars and cafés increased significantly in the main centres. Sales figures for June and July 2005 released by credit card operator Visa International show visiting Lions fans pumped millions of dollars into the New Zealand economy. Although results didn’t go their way, the Lions supporters certainly had a good time. The impact is bound to be significantly greater this year with numbers of supporters up to around 20,000. However as with the 2005 tour there will significant infrastructure problems in meeting this demand. After the win in Australia four years ago maybe the Lions could pull off a series win – the last time was 1971. This entry was posted in Sport, Trade and tagged Dairy, New Zealand, Tourism on April 30, 2017 by Mark. Agricultural markets are particularly vulnerable to price fluctuations. many agricultural products have inelastic demand and inelastic supply. This means that any change in demand or supply has more of an impact on price than on quantity. Price fluctuations can also arise due to the time lag between planning agricultural production and selling the produce. The cobweb theory (so-called because of the appearance of the diagram) suggests that price can fluctuate around the equilibrium for some time, or even move away from the equilibrium. Dairy farmers base their production decisions on the price prevailing in the previous time period. The supply of dairy products in New Zealand fits this assumption – farmers make their production decisions today, but the dairy cooperatives (Fonterra, Westland, etc.) don’t make a final decision on the price farmers will receive until close to the end of the season. 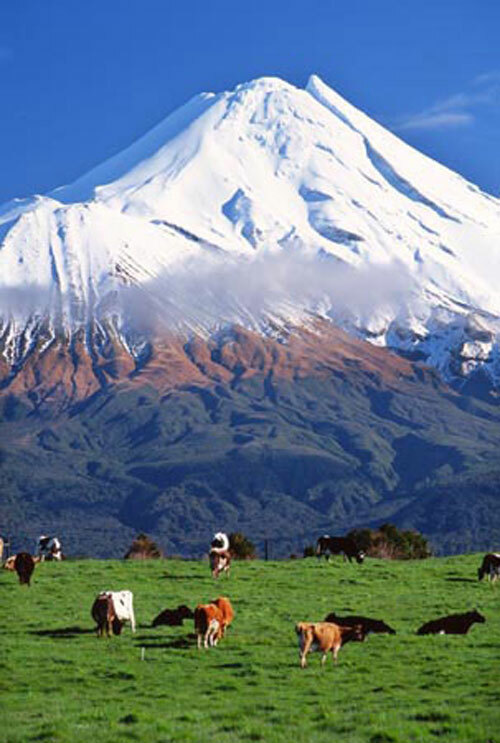 However the New Zealand dairy industry faces a severe test over the next year. World price for dairy products have reached their lowest levels since late 2002. Last seasons low milk price $4.40/kg is to be followed by a payment of $3.70/kg. So, what has happened? At the start of the milking season, farmers’ expected price was $7.00 per kg of milk solids (unless they had prescience), so they based their production plans on that price. In the diagram below, say that D0 and S0 are the initial demand and supply curves, respectively, with demand for dairy products relatively high. Farmers, who expect the price P0 ($7.00), produce Q0 units of dairy products (this is the quantity supplied on the supply curve S0, with the price P0). By the end of the season though, demand has fallen to D1. When the farmer cooperative tries to sell Q0 dairy products, the price falls to P1 ($4.50; this is the price where the quantity demanded, from the demand curve D1, is exactly equal to Q0). Now, going into the next season farmers observe the low price P1 ($4.50) and expecting that low price to persist, they produce Q1 units of dairy products (this is the quantity supplied on the supply curve S1, with the price P1). Come the end of the season, the farmer cooperative finds that they can sell the Q1 dairy products for the much higher price P2 (this is the price where the quantity demanded, from the demand curve D2, is exactly equal to Q1). Now the price is high, farmers produce more but at the end of the season, the price falls… and so on. Essentially, the market follows the red line (which makes it look like a cobweb – hence the name of the model), and eventually the market gets back to long-run equilibrium (price P*, quantity Q*). Source: Michael Cameron University of Waikato. Price fluctuations can drive some dairy farmers who would make a profit in the long run form the industry and discourage other farmers from entering the industry. Farmers may also leave the industry as a result of the tendency for the price of dairy products to fall. This is because demand does not tend to increase at the same rate as supply. Demand for most agricultural products is income inelastic, so that demand rises relatively slowly. This entry was posted in Supply & Demand, Trade and tagged Cobweb Theory, Dairy, New Zealand on September 7, 2015 by Mark. Both Australia and New Zealand face the worrying prospect of the impact of lower commodity prices. For Australia it is iron ore whilst across the Tasman it is the dairy industry. So how will each economy be affected by this? US$4999/tonne on 18th February 2014 to US$2270/tonne on the 16th December – a 54.6% decrease. This downturn in prices will have a significant impact on the rural economy of NZ. The lower prices will not only reduce dairy farmers’ incomes, but there will be a knock on effect in other parts of the local economies as farmers and contractors will be less inclined to spend or invest in anything but necessities. Short-term credit facilities will be able to help farmers with their costs but permanent lower returns would cause a rethink regarding production capacity and economies of scale. Who will take the biggest hit? It is expected that Aussie will take the biggest hit mainly because of the tax revenue lost through lower iron ore prices. In NZ dairy farmers are not big tax payers and the NZ government are not expecting a big fall in tax revenue. Furthermore overall economic activity is largely unaffected as milk production is likely to continue in the short-term. However the falling unemployment rate in NZ and a rising level in its Trans Tasman neighbours suggests NZ is in a much better state to weather the storm. Other indicators below favour NZ. These include GDP growth and consumer confidence as well as having the ammunition of being able to cut interest rates further, a situation that Australia might find difficult. This entry was posted in Growth and tagged Australia, Commodities, Dairy, New Zealand, Primary Sector on January 6, 2015 by Mark. This entry was posted in Economic History, Trade and tagged Dairy, New Zealand on October 30, 2014 by Mark. With the dairy industry accounting for approximately 25% of NZ’s export market, a reduction of dairy prices by 46% from last year will definitely slow growth over the next year. Lower prices will also mean a deterioration in the terms of trade and a bigger current account deficit. 3. Question marks around Chinese demand amid reports of high inventory levels. The graph below suggests that there will be $5.5bn less revenue coming into the economy – 2.3% GDP. This entry was posted in Growth, Trade and tagged Dairy, New Zealand, Primary Sector on October 24, 2014 by Mark. Triple whammy for New Zealand Dairy Farmers? 1. Last week saw a 8.9% drop in the Global Dairy Trade (see graph below) which has meant that prices have dropped 35% since February – their lowest level since December 2012. Farmers can expect revised payout forecasts of less than $6 a kilogram of milksolids to follow the 35% fall.To give you an idea of how the lower payout will influence the rural economy – a forecast of a $6.25/kilogram of milksolids would take $3 billion out of dairy incomes – Con Williams ANZ Bank. 3. On Thursday RBNZ Governor is making an announcement on the OCR (Official Cash Rate) and famers are hoping that Graeme Wheeler will not hike interest rates as originally indicated in the June Monetary Policy Statement. Inflation has been somewhat benign but interest rates seem to be influenced more by Auckland house prices and the Christchurch rebuild. USA – higher milk prices and lower feeds costs are said to add another 2bn litres this year. Therefore big surpluses accompanied by weaker demand would hit NZ dairy export earning considerably. This entry was posted in Growth, Trade and tagged Dairy, New Zealand, Primary Sector on July 22, 2014 by Mark.